May 18- General Federation of Nepalese Trade Unions (GEFONT) National Council meeting concluded today adopting various resolutions. The Council reviewed the past political and organisational activities and endorse the annual programme tabled by GEFONT Secretariat. CPN (UML) General Secretary addressed the Council as the principle speaker. Welcomes and supports today's Proclamation of Hose of Representatives which fully establishes Nepali Peoples' sovereignty as the sources of state-power. Requests Nepal Government to announce Jeth 04 (May 18) as the Loktantrik Day to be celebrated every year. Proposes the Nepal Government led by SPA to formulate and execute every policy collectively, despite previous practice of running ministries differently according to the own policy of leading parties of the coalition. Pays tribute to the martyrs of the Loktantrik movement and extends condolence to the bereaved families. Extends best wish for the fast health recovery of the injured comrades-in- movement and demands for the proper relief arrangement with due compensation. Endorses the on going initiatives of Single unionism considering a goal of Dignifying Working class and prosperous life. Extends heartiest thanks to all workers, their families, our members and affiliates for their heroic participation and contribution in the Loktantrik movement. Instructs all affiliates and local structures to start series of discussion on effective participation and inclusion of workers during the process of Constituent Assembly election and afterwards in the new Loktantra. Requests to ensure "No unelected Customary Power in the name of Divinity may rule over Sovereign People"
The meeting presided by Chairman Mukunda Neupane; where the summary report of the Secretariat was tabled by the Secretary General Binod Shrestha. 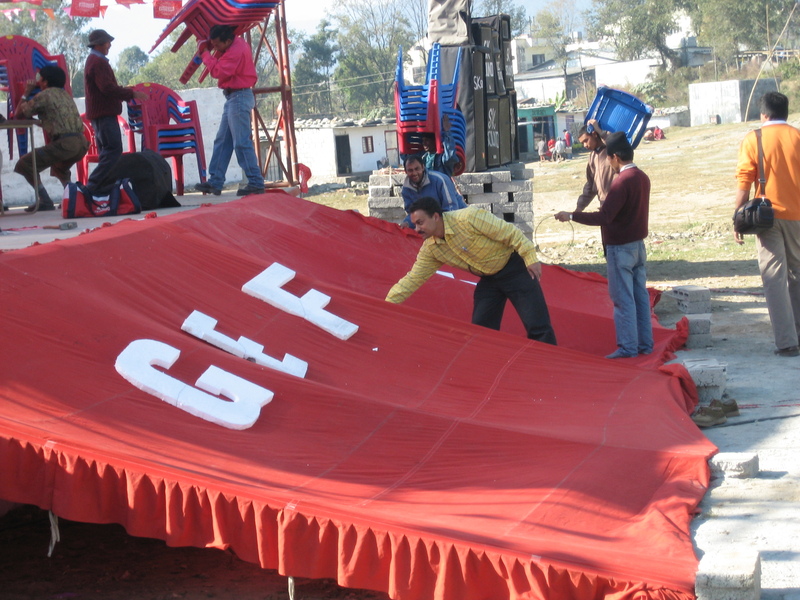 GEFONT National Council meets annually. It is the powerful body between two Congresses, which guides the National Executive Committee on Policies and Programmese our Victory together!! This boy Khagendra Thapa was born 14 years ago in Baglung District the Dhaulagiri Zone in NEPAL. His father Roop Bahadur Thapa recalls and says that he was born like a chicken out of an egg. Last Friday, March 25, 2006 this 20 inch tall boy was brought to Pokhara by his father and almost all the people of Pokhara was there to see him. Everyone was so amazed to see this child. It was like a Lilliputian out of Gulliver Travels story. Everyone was so amazed to see this boy playing, singing and speaking. People were laughing at the same moment by seeing some funny activities of this boy. He was so active and everyone was so amazed to see such a small human with such liveliness. There were lots of News paper guys around him, everyone were asking lots of questions to him and he was answering all the questions, there were lots of Photo Journalists too. There were flashes after flashes to capture this scene in the camera. Roop Bahadur Thapa, the father of 20 inch boy Khagendra says that he is very worried for the physical structure of his eldest son. He has another son who is 9 years of age with normal mental and physical development. Roop Bahadur Thapa says that he had his son Khagendra sent to the school but every other kid in the school used to carry him as if he was a doll and every kid teased him so he was forced to stop the schooling of his son. Due to low financial status Roop Bahadur Thapa is worried that he is not being able to show his son to the doctors. He says that he want to show his son to a doctor for the health status. Now he has brought his son to Pokhara city so that he can collect some money that will be helpful for the medical checkup of his son. 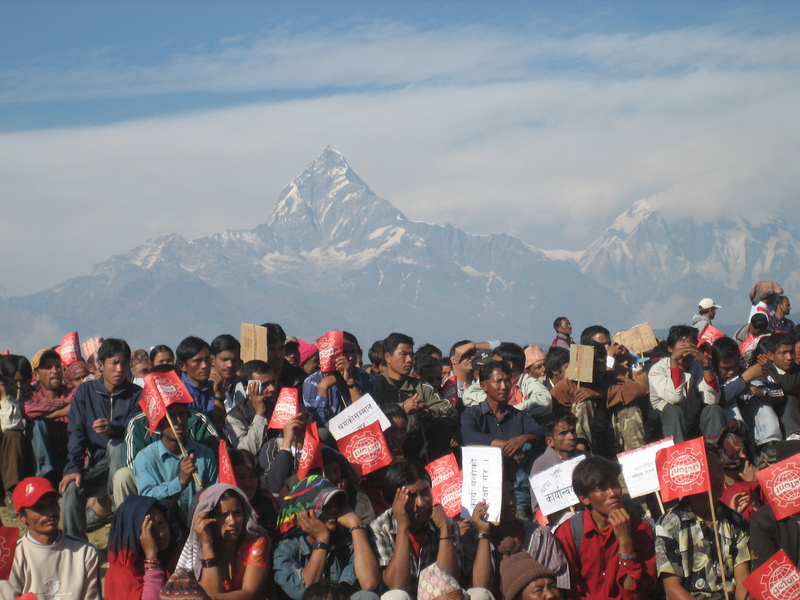 On Monday, Nepal's Maoist movement marks its 10th year of insurgency in the Himalayan kingdom. In a rare move, the rebel leader, Prachanda, spoke out about the conflict that has claimed some 13,000 lives - and the possible exile or execution of Nepal's King Gyanendra. It was difficult to believe that the man sitting modestly in the corner was Pushpa Kamal Dahal, better known under his nom-de-guerre of Prachanda ("The Fierce One"). This is a man whose face, until a few weeks ago, was known only through a single photograph, taken in rural Nepal in 2001. In that photo his forehead is creased in a frown of concentration. The 52-year-old man I met, with his speckled beard, was mild-mannered, shy, joking, laughing nervously - more humorous than intimidating and without the overt charisma of some revolutionary leaders. He looked more like a popular uncle than a communist who has been underground since 1981 and waging war for a decade. His number two, Baburam Bhattarai, with a cloth cap and eagle eyes, and flanking Prachanda, looked much more revolutionary. But once seated in front of the camera, Prachanda grew more intense, periodically thrusting forward his tensely hunched shoulders as he spoke. It was as if the words were inside him, waiting to be forcefully expelled. March 4- In the cordial support of Korean colleagues related to Migrant Solidarity Centre, GEFONT organise a Child Support programme II in Mahadev Besi, Dhading some 40 KM west from Capital City. A group of 16 Korean colleagues visited there, they donated sum of USD 5,100 to construct community school building where the kids of labourers are studying and offered stationary materials for the school kids as well. They further performed Korean cultural programme on the occasion. There was a brief ceremony organised amidst huge local mass where various dignitaries including GEFONT vice-chairman Bishnu Rimal, Dy General Secretary Binda Pandey, 3F-Denmark leader Soren Haugard and UML leader G.L Tuladhar addressed. Armed Police Force (APF) personnel on Thursday arrested CPN-UML General Secretary Madhav Kumar Nepal, who was under house arrest for over past two months, from his residence at Koteshwor. A team of APF men arrested Nepal at around 4:15 this afternoon and took him to the APF barracks at Kakani, Nepal’s PA Yadav Sharma told ekantipur over the phone. The APF men had phoned Nepal’s wife before arresting him. “They (police) called me at my office and asked me to come home saying they were arresting him (Nepal),” Nepal’s wife told journalists. Only yesterday, APF personnel raided Nepal’s residence and seized some communication devices. About a dozen APF personnel under the command of Senior Superintendent of Police Madhav Thapa, searched his house and took away a computer, a fax machine, telephone and cordless sets. In his reaction to the government move, Nepal from the terrace of his house, termed the incident “the height of lawlessness." The authorities, however, returned all the seized equipment this afternoon. Nepal was placed under house arrest on January 19. The government extended Nepal’s house arrest on February 20 by an unspecified period. In yet another move, government authorities this morning stormed into the houses of Nepal’s two brothers at Koteshwor and snatched away electronic appliances including computers and telephone sets. The government’s action comes in the wake of the seven-party alliance’s intensified preparations for the upcoming “huge mass demonstrations” slated for April.8. Throughout history, young people have helped bring social and political change. In Nepal, the People's Movement of 1951 and again in 1990, it was students who helped give power to the people through a system of multiparty democracy. The campuses are once more in ferment after the royal takeover. The student wings of various political parties are again at the forefront of the struggle to restore democracy. But while many political factions in government colleges protest and demonstrate, a large number of students in private institutions are not as active. Before the municipal elections in early February, the students of Amrit Science Campus in Lainchor were pelting stones and shouting slogans to protest the February First move while students from neighbouring private colleges, NIST and Kanya Campus, stood watching the demonstrations. Ironically, the onlookers outnumbered the demonstrators. The scenario was much the same all over the capital. A majority of private college students remain aloof. Does this mean that these young people are unaware of the country's political status? "I wouldn't say we are unaware or ignorant. 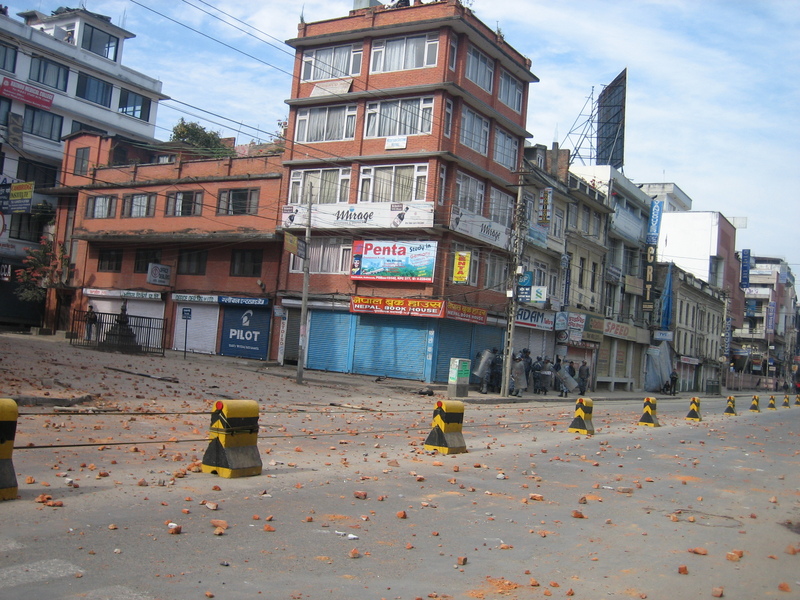 We know what's going on, we just don't think pelting stones or vandalising public property is the way to do it," says Pratikshya Regmi of Institute of Advanced Centre for Education and Research. Politics has become the topic of many conversations as the 10-year conflict drags on. "During breaks, we discuss politics as we realise it affects our lives directly," adds Regmi, "we even had to write a paper on the failure of municipal polls, which is something that wouldn't have happened a few years back." Girls of Padma Kanya Campus carrying an effigy to symbolise regression in a funeral procession. The urban youth are aware of the Maoist conflict and though some think that politics isn't a matter of their concern, they are starting to understand that it directly affects their lives. Most of them are too young to remember the details of the Panchayat era but when on 1 February 2005, telephone and Internet services went suddenly dead, they knew that certain rights had been seized. What these young people still fail to grasp is that if problems are not addressed, they will continue to grow. However, the silent majority of students frown upon enforced bandas, burning tyres, scrawling slogans and destroying public property. They don't think the end justifies the means. In fact, such violence and vandalism are the reasons why private college students have remained distant and disillusioned with the 12 years of multiparty democracy. What the difference in opinions between students of private and public colleges does expose, however, could be class. The privileged are more in favour of the status quo. "The new generation does not look at what we gained after 1990, these gains outweigh the corruption and the instability of that period," says student leader Gagan Thapa, who is among the few well-educated individuals to enter Nepali politics. "We have not been able to reach students in private institutions. There is no dialogue. We need to listen to them and share our views." Thapa, who led many destructive protest programmes in colleges, has now changed his stance as he says, "Burning effigies and throwing stones got us nowhere. Peaceful protests are more effective and appeal to the majority." More than half of the 9 million young Nepalis are students. About 1,50,000 attend private colleges while an estimated 3,00,000 attend government colleges. There are no political student affiliations in private colleges. Though the eight student organisations in Nepal claim to have the participation of 6,00,000 students, only 2,00,000 students of Tribhuvan University affiliated colleges are actively involved. Silent protest against media censorship after 1 February. The abduction and torture of students by Maoists three years ago prompted Sandesh Adhikari, Dipendra Tamang, Urmila Thapaliya, Ajay Babu Shivakoti, Subodh Acharya and friends to start Alliance For Peace (AFP). They report to the Human Rights Commission and United Nations about abduction and detention of students in Nepal. "There's no need to go to the streets. We contribute whatever we can," says Sandesh Adhikari of AFP. About the plus-two generation, he adds, "They prioritise their studies and careers, and are disinterested in politics. They are always looking to fly abroad but I believe they can be made politically aware through education." Private institutes might not have political student organisations but they do have student councils and alumni associations. AFP's Dipendra Tamang says, "Few councils and alumni associations raise issues of Humla, Jumla or Ratna Park. They concentrate on fashion shows, dance parties, and picnics. Young people are taught that politics is a dirty game. 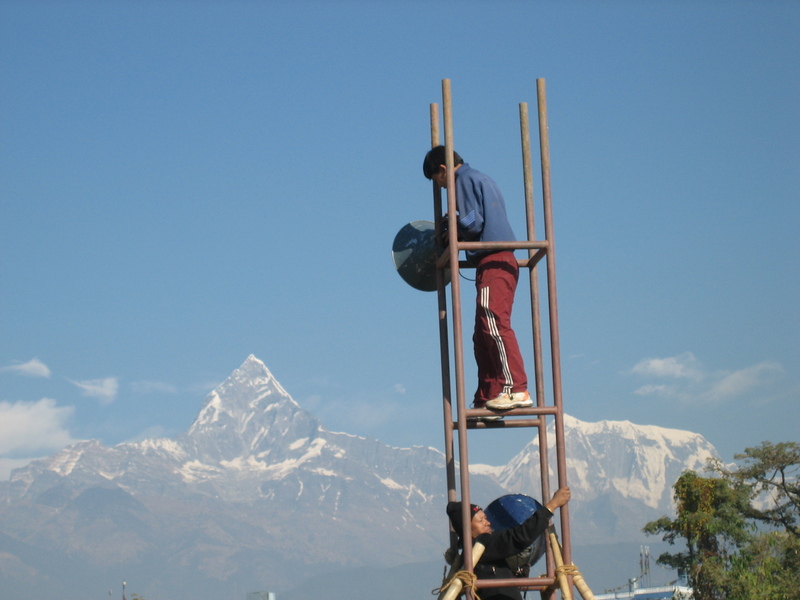 Most don't expect to live in Nepal forever." When they do go abroad, many Nepali students hunger for news from home. "I'm always reading up on news and following the events in the country. Every night I log on to nepalnews.com and other Nepali news sites to find out what's happening," says Rajan Adhikari, who's studying at a university in California. He adds, "When we meet other Nepalis, we always ask for news from home. We weren't as aware of politics in Nepal as we are now." A college girl plastering posters in the run-up to student elections. According to AFP records, not one percent of the urban young are involved in protest programmes. Pashupati Campus is the only private college in Kathmandu whose students take to the streets in pro-republic programmes. "Even if we are interested in political goings-on, we've heard of various parties using students for selfish purposes, even paying them to stage protests, which is a turn-off," says Srijana Limbu, who studies in Kathmandu University School of Management. Lack of political interest in private college students is also because they are very career-focussed. Abhinav Baidya, an Apex College graduate who's looking for a job, says, "I don't want my investment in studies to go to waste. Most students want to fly abroad so why bother with politics? Our focus is on building a career." Yubaraj Khatiwada of Nepal Commerce Campus believes that if student organisations could reach such students, politics in Nepal could have a better chance. He adds, "Career-focussed students should understand that if the political situation of the country is not stable and the economy continues to plummet, their dreams of a career could be in jeopardy." Young engineers throwing stones to protest the hike in fuel prices. A classic example of the great divide is the eight student organisations' demonstration staged three years ago against expensive tuition fees in private educational institutions. The students of private colleges resented their demands saying the protests had disrupted their studies. Many colleges even make students and their parents sign application forms agreeing not to get involved in political activities within the college. Contrary to this, in government colleges, students themselves initiate and arrange political programmes. Today, as Nepali TV serials with political satire grow popular, even high school students are beginning to ask about democracy, republicanism, and monarchy. Akhil Nepal National Free Students Union's (ANNFSU) president Khim Lal Bhattarai believes that sooner or later the young generation will join the campaign for a republic. But ANNFSU admits to being unable to spread into private colleges. Bhattarai adds, "Even then, the majority of protestors today are students, which is a good sign. Many young people still doubt politicians." Nepal Students Union president Pradip Paudel says that only political awareness and action can change the country's political situation. "If we don't care about the country's future, who will?" he asks, "It is up to us to make sure that tomorrow's leaders are good enough. To remain silent is a weakness and a breach of your own rights." Nursing students show their solidarity for democracy at a protest programme. Akhil's female leader Ram Kumari Jhankri agrees with Bhattarai. "You can't say 'I have what I want so why bother about others'," she adds. Binita Adhikari, chairperson of Padma Kanya Campus' Free Students Union agrees, and says awareness is the key. "All the students in our campus might not join the street protests but they raise their voices when they can," says Adhikari, "they are free to choose when and how to act. As students, if you are really future-focussed, politics could help make a difference. You might lose two years of study but you will have a future of 200 better years." Street protests aren't the only way to participate in politics. Sarahana Shrestha went to the US to study computer graphics four years ago. She wasn't concerned about politics then, now, she runs samudaya.org. She started the website after 1 February 2005 to create a platform for Nepalis all over the world to express their views. A few months later, it was banned by the state along with a few other pro-democracy sites. Says Shrestha: "Politics plays a major role in our future, many don't understand this. We don't support the Maoists, rather we've been criticising those who go against democracy." Samudaya.org can still be viewed through mirror sites like www.everybodybreed.com. A multimedia designer for Greater Than One Interactive Online in New York, Sarahana devotes whatever time she has between schedules to raise awareness about politics among young Nepalis. Her latest is a T-shirt campaign with the slogan 'Naya Nepal Sambhab Chha'. 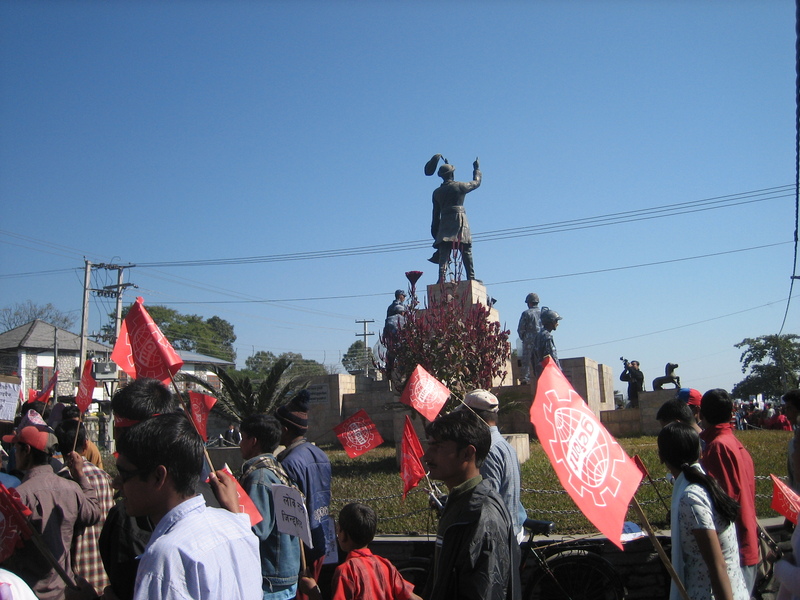 A young man raises his hands from the statue of Prithivi Bir Bikram Shah in front of Singha Darbar on 6 April 1990, hours before King Birendra gave up direct rule. 1951: Young Nepalis help end 104 years of Rana Regime. The protest gains momentum after students of Tin Dhara Paatshala declare Jayatu Sansritam. 1961: King Mahendra's coup ends democracy and brings in 30 years of partyless Panchyat. The regime creates a pro-government student union (called 'Mandales') to marginalise party-affiliated pro-democracy students. 1980: Student-led protests force King Birendra to announce a referendum on democracy. The people vote for a reformed Panchayat system. 1990: Students actively participate in the People's Movement in the streets that snowballed, forcing King Birendra to unban the parties and give up his absolute powers. 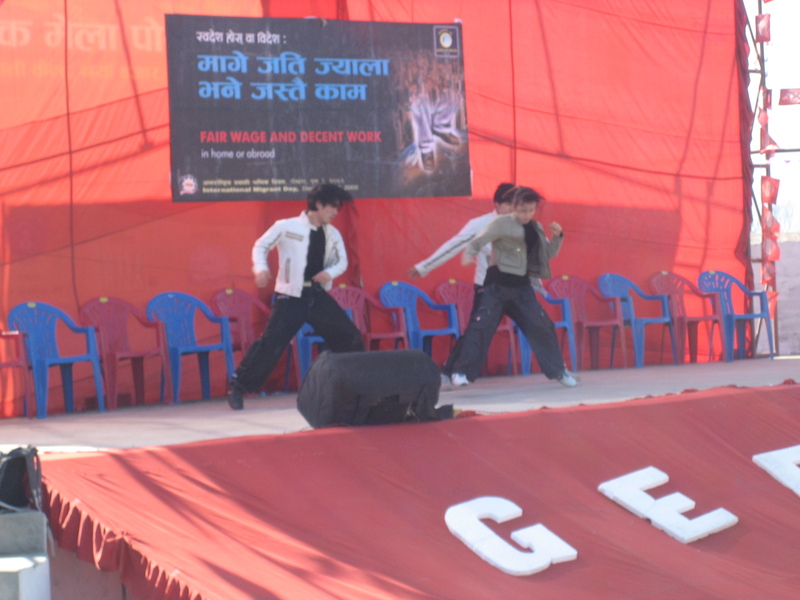 GEFONT observed December 18- the International Migrants' Rights Day staging a workers rally with a participation in Pokhara. Demanding democracy and peace the marchers rallied different parts of the city and finally converged into mass meeting in local Exhibition ground. The mass meeting was jointly inaugurated by 5 ex-migrant namely Mangal Gurung, Prabina Gurung, Radhika Rai, Mitra Lal Pahari, Damodar Timilsina returned from various countries along with retired Lieutenant Victoria Cross winner ex-British Gurkha Tul Bahadur Gurung. Chairman Mukunda Neupane and other dignitaries in the programme lit the candle in memory of all deceased Nepali during performing their jobs in aboard. As of previous year, this year as well 5 foreign delegates 4 from Migrant Trade Union (KCTU- Korean Confederation of Trade Unions) and 1 from Solidarity for Migrant Rights Korea participated in the programme. Among the major civil society organisations, Tamu Dhi-Kaski; Magar Association, WOREC, private & boarding school association participated in the programme. Popular Singer Sambhu Rai and Korean artists along with local performers perform cultural event on the occasion. This programme is a part of GEFONT policy of Regional mobilisation as adopted during 4th National Congress 2004. In home or aboard- Fair Wage and Decent work was this year's theme slogan. The programme was chaired by Chairman Neupane where various speakers addressed the mass meetig. raju who took the picutres? wish you a happy new year! Following documentary was posted a short time ago by comrades of mine (Mahbub and Raju). So I also will post it here, but including some background informations and (perhaps) useful links. According to the Communist Party of Nepal(Unified Marxists/Leninists, UML) the struggle against the monarchy in Nepal started in the late 1940's of the last century. 1951 - End of King Rana rule. Sovereignty of crown restored and anti-Rana rebels in Nepalese Congress Party form government. 1985 - Communists begin civil disobedience campaign for restoration of multi-party system. 1986 - New elections boycotted by communists. 1990 - Pro-democracy agitation co-ordinated by communist and leftist groups. 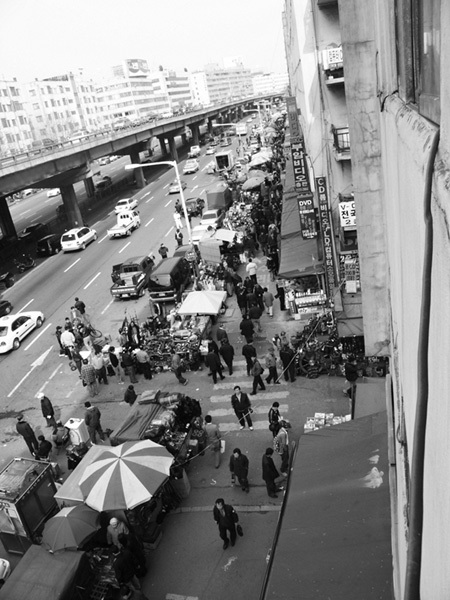 Street protests suppressed by security forces resulting in deaths and mass arrests. King Birendra eventually bows to pressure and agrees to new democratic constitution. 1994 - Koirala's government defeated in no-confidence motion. New elections lead to formation of UML Communist government. 1995 - Communist government dissolved. Radical leftist group, the Nepal Communist Party (Maoist) begins insurrection in rural areas aimed at abolishing monarch and establishing people's republic. 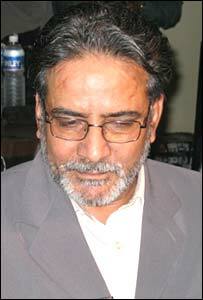 1997 - Continuing political instability as Prime Minister Sher Bahadur Deuba is defeated and replaced by Lokendra Bahadur Chand. Chand is then forced to resign because of party splits and is replaced by Surya Bahadur Thapa. 1998 - Thapa stands down because of party splits. GP Koirala returns as prime minister heading a coalition government. 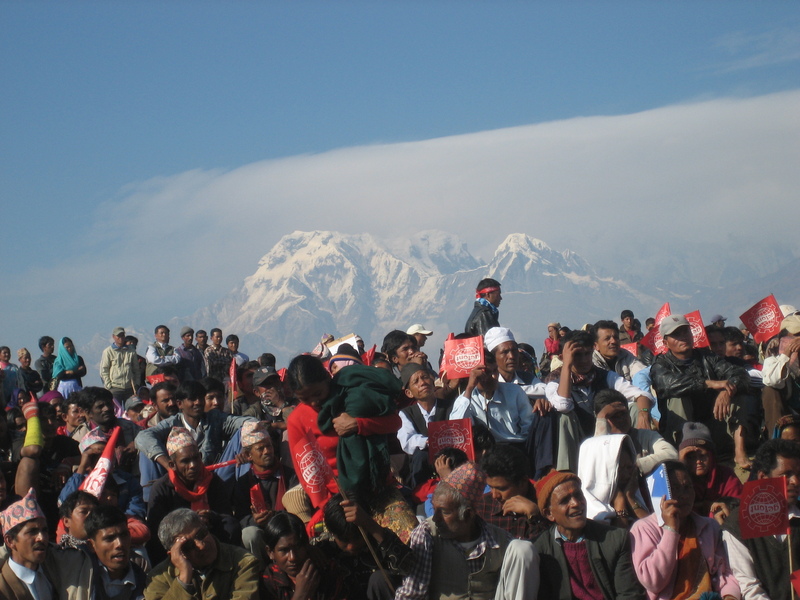 1999 - Fresh elections give majority to Nepali Congress Party. Krishna Prasad Bhattarai becomes prime minister. 2000 - Prime Minister Bhattarai steps down after revolt in Nepali Congress Party. GP Koirala returns as prime minister, heading the ninth government in 10 years. 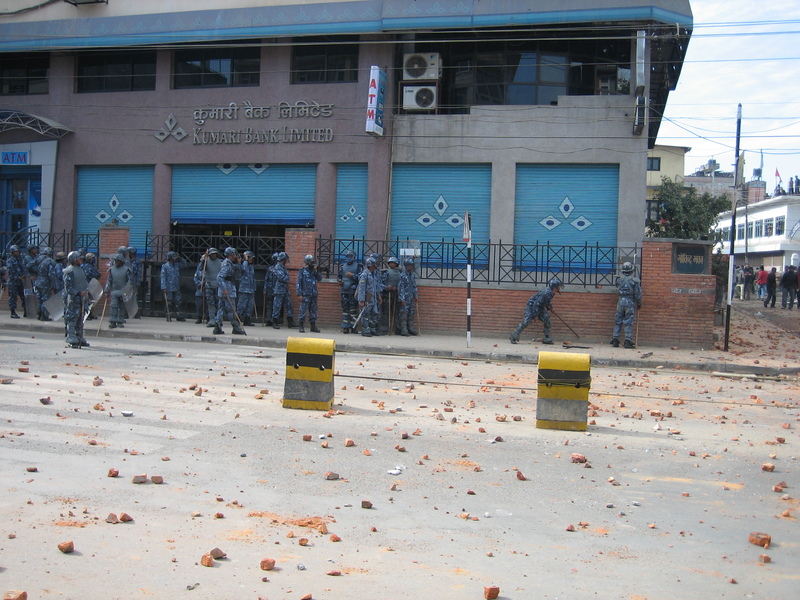 2001 April - General strike called by Maoist rebels brings life in much of the country to a virtual standstill; police arrest anti-government demonstrators, including some opposition leaders, in Kathmandu. 2001 1 June - King Birendra, Queen Aishwarya and other close relatives killed in shooting spree allegedly by drunken Crown Prince Dipendra, who then shoots himself. 2001 4 June - Prince Gyanendra crowned King of Nepal after the late King Birendra's son, Dipendra - who had been declared king on 2 June - died of injuries sustained during the palace shooting. 2001 July - Maoist rebels step up campaign of violence. Sher Bahadur Deuba becomes prime minister, heading the 11th government in 11 years, after Girija Prasad Koirala quits over the violence. 2001 July - Deuba announces peace with rebels, truce begins. 2001 November - Maoists say peace talks have failed, truce is no longer justified. Launch coordinated attacks on army and police posts. 2001 November - State of emergency declared after more than 100 people are killed in four days of violence. King Gyanendra orders army to crush the Maoist rebels. 2002 April - Maoist rebels order five-day national strike, days after hundreds are killed in two of bloodiest attacks of six-year rebellion. 2002 May - Intense clashes between military and rebels in the west. Rebels declare one-month ceasefire, rejected by government. Deuba visits Britain and other states, seeking help in the war against Maoist rebels. US President George W Bush pledges $20 million. 2002 May - Parliament dissolved, fresh elections called amid political confrontation over extending the state of emergency. Deuba expelled by his Nepali Congress party, heads interim government, renews emergency. 2002 October - Deuba asks king to put off elections by a year because of Maoist violence. King Gyanendra dismisses Deuba and indefinitely puts off elections set for November. Lokendra Bahadur Chand appointed to head government. 2003 May/June - Lokendra Bahadur Chand resigns as prime minister. King appoints his own nominee Surya Bahadur Thapa as new premier. 2003 August - Rebels pull out of peace talks with government and end seven-month truce. Rebels call three-day general strike in September. late 2003 onwards - Political stalemate; clashes between students/activists and police; resurgence of violence. 2004 June - King Gyanendra reappoints Sher Bahadur Deuba as prime minister. 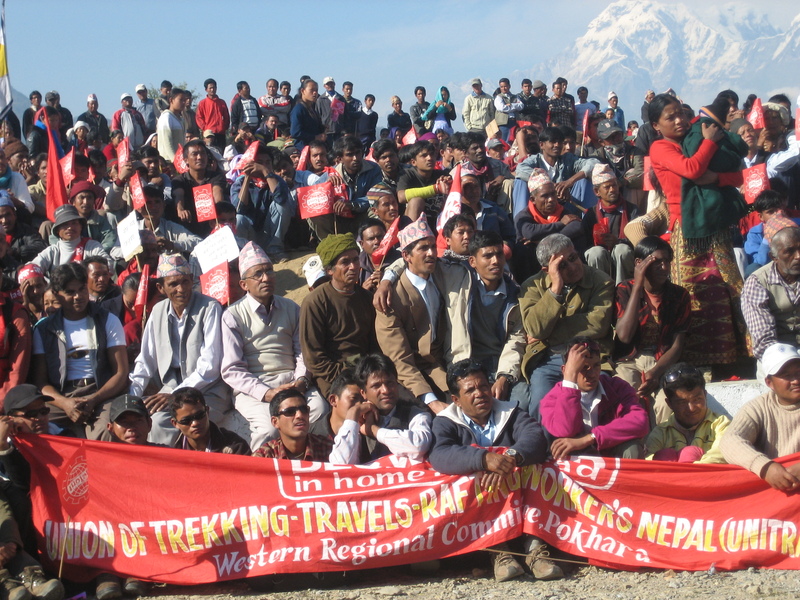 2004 August - Maoist rebels stage week-long blockade of Kathmandu, stopping supplies from reaching the city. 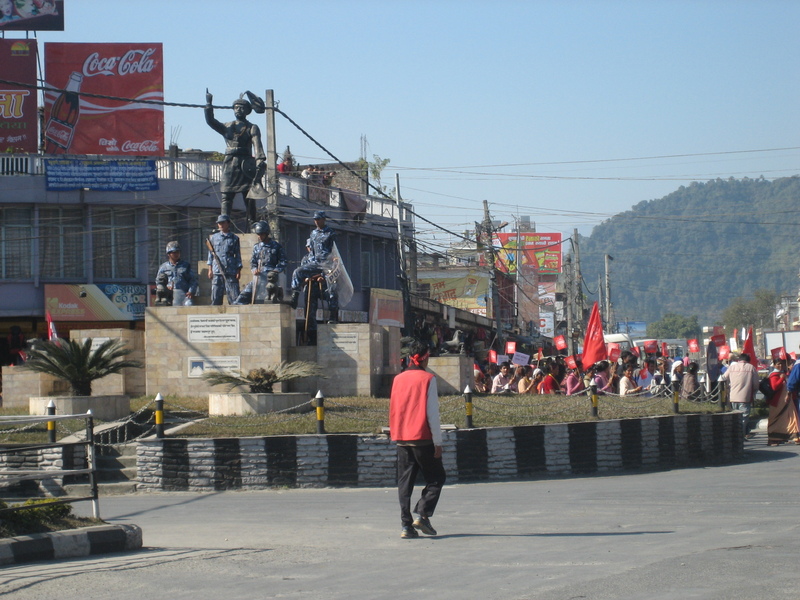 2004 December - Maoist rebels stage week-long blockade of capital. 2005 February - King Gyanendra dismisses Prime Minister Deuba and his government, assumes executive power, declares state of emergency. KATMANDU, Nepal Nepal's Maoist rebels said Monday that they would not extend their four-month unilateral cease-fire that was to end at midnight. The rebels' truce started Sept. 3 and was later extended by a month in response to public pressure. The announcement on Monday came after rights groups and political parties here had asked the insurgents to extend the cease-fire. "We have found out that the rebel leaders are holding consultations whether to further extend the cease-fire," Jhanath Khanal, a leader of the Nepal Communist Party-United Marxist Leninist, said early Monday. "We have asked them to prolong the truce by at least another 15 days and give the government another chance." The Royal Nepalese Army had not matched the cease-fire and called it a ploy by the militants to buy time to reorganize. On Monday afternoon, the Maoists said they would not extend the truce because the military continued to press its campaign against them. "The royal army is surrounding our people's liberation army, which is in defensive positions, to carry out ground as well as air attacks on us," the rebels said in a statement. "Therefore, we are compelled to go on the offensive not only for the sake of peace and democracy but for the sake of self-defense." Political groups in the capital had awaited the rebels' decision with some hope of success. The European Union and the United Nations secretary general, Kofi Annan, had issued statements urging the Maoists to extend the cease-fire in their "people's war." In November a group of seven opposition parties, four of which were removed from power by King Gyanendra in February, reached a 12-point agreement with the Maoists. The agreement was intended to get Gyanendra to step aside and restore multiparty democracy in this impoverished Himalayan country. Under the cease-fire, the rebels pledged not to attack military or civilian targets in hopes of reviving peace talks but said they would continue to defend their positions. They have, however, continued to block highways, extort money and kidnap villagers for indoctrination sessions. Political parties said that the rebels were being provoked by the government's refusal to join the cease-fire and its description of the militants as terrorists. 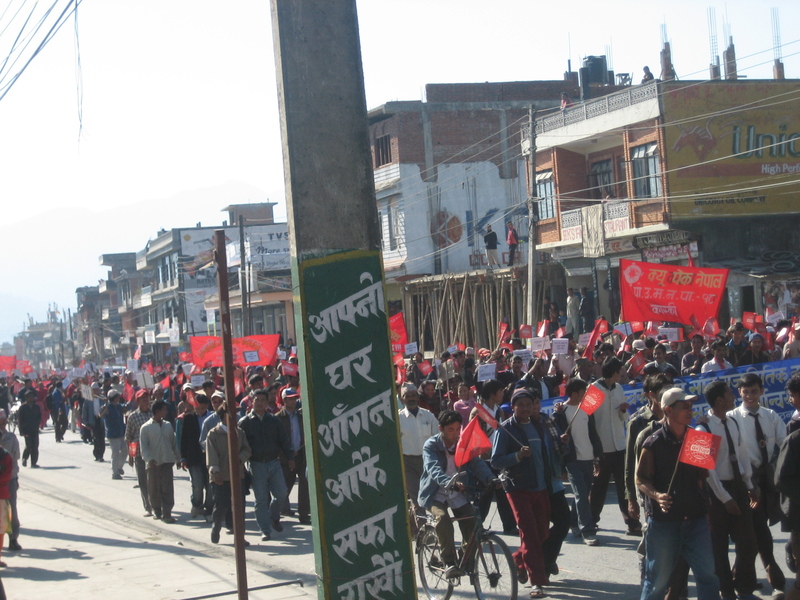 "The government statements and attitude is angering them," said Pradeep Nepal of the Communist Party of Nepal. The rebels have agreed with the country's seven main political parties to step up their opposition to the administration of the king, who dismissed a provisional government and seized absolute power early last year. The rebels, who claim to be inspired by Mao Zedong, have been fighting to topple Nepal's monarchy and establish a communist state. More than 12,000 people have died in the decade-long insurgency. Nation is under a painful transition from violent conflict to peace and from autocracy to democracy. Entire people including political parties, professional and trade unions, civil society, youth & students are in street struggle. We extend our support and solidarity to the efforts of political parties for Peace and Full-fledged Democracy on behalf of democratic forces in Nepal. Today is the First Day of New Year 2006 and also the last day of cease-fire declared by CPN (Maoist) for 3 months in the beginning and additional one month as the significant outcome of continued efforts of main-stream political parties. During the period, a historical 12-point Understanding for peace and restructuring of Nepali society & governance has been reached between 7- agitating political parties and CPN (Maoist). However, the present autocratic regime has taken it negatively and created obstacle in the peace process. The frequent appeals of international community to abandon the hue and cry of election drama and to take initiative for peace have been ignored by the Royal Regime. On the Eve of New Year 2006, UN Secretary General Kofi Annan and European Union have called-on again to continue cease-fire to the Maoist and reciprocate it to the regime. We welcome this call in favour of entire Nepali working people and extend heartfelt thanks to UN and the EU. On this occasion, we would like to take an opportunity to extend the best wishes of the New Year to Nepali people, working mass and the whole globe. People are worried in the fear of the end of relief prevalent during the past four months. At the moment, we demand with both the regime and Maoist not to push the nation and people towards blood-shed and game of death again. 모든 것이 흐믈 흐믈 해지는 나른한 오후... 버스창에 머리를 기대어 단맛 나는 쪽잠을 청하고 있었던 어느날 버스안에서 그 가난의 처절함 때문에 참담해진 가슴을 쓸어내렸던 기억이 난다. 그저 흔하디 흔한 오후 한낮의 버스안 풍경의 일상이 있었을 뿐이다. 그 무료함을 깨우는것은 무심하게 틀어 놓은 라디오에서 나오는 수다스런 디제이들의 말장난과 서민의 애환을 달래주는 편지글들 뿐. 그 글을 듣고 있거나, 디제이가 던지는 맨트에 간혹 킥킥거리며 응수하는것이 전부였다. 어느 가난한 아내는 오늘도 가족을 위해, 일터에서 여념이 없을 남편에게 사랑 가득한 편지를 띄웠다. 아마 이들 부부는 가난한 연인으로 만나, 결혼식도 제대로 올리지 못하고 그럭저럭 살림을 차리고 살아가다가 아이가 초등학교 입학할 무렵 주변 사람들의 도움으로 늦깍기 결혼식을 올린 모양이다. 그들은 모처럼 큰 맘 먹고 신혼여행 겸 여름 피서 계획도 세우고, 친지 친구들과의 한판 잔치 계획도 세웠다. 그러나 그런 꿈들은 항상 가난한 사람들에게만 호락호락 하지 않다. 그런건 언제나 가난한 사람들에게만 유독 사치품 같은 꿈이 된다. IMF라는 괴물은 이들 가난한 부부에게도 찾아왔고, 다행히 실업자 신세는 면했지만 그다지 넉넉하지 않았던 월급봉투는 절반으로 줄어 한달 생활하기에도 빠듯하기만 했다. 그나마 그 월급이라는 것도 계속 제대로 받을 수 있을지 의문이다. 오랫동안 너무나 써보고 싶었던 면사포였지만 그녀는 담숨에 포기해 버렸다. 10년 만에 처음으로 신혼여행에 업혀가는 여름휴가 였지만 그녀는 그 호사도 포기해 버렸다. 좀 아깝기는 했다. 그냥... 가까운 강가에 가서 식구들하고 딱 하루, 발만 담그고 오려고 했었다. 그런데 뭐...정리해고다 뭐다 해서 하루아침에 실업자 된사람들이 어디 한둘인가... 아예 공장이 문을 닫아버려 퇴직금은 고사하고 몇달치 월급도 제대로 못챙겨 나온 사람들이 수두룩한데...뭐.. 그까짓 웨딩드레스가 대수겠는가. 그까짓 여름휴가가 별거였겠는가. 대신, 이들 부부는 평소 애들이 먹고 싶다고 졸라도 심장이 벌렁거려 감히 사먹어 보지도 못한 아이 머리통 두배 만한 수박을 큰맘 먹고 사서 온가족이 배터져라 먹어보기로 했다. 그리고 대야에 찬물도 받고, 얼음도 띄우고, 거기에 발 담그고 선풍기 강풍으로 틀어 놓는 것으로 그해 여름 피서를 대신하기로 했다고 했다. 그리고 편지 마지막 부분에서 이들 가난한 부부는 갑자기 초라해진 휴가를 이렇게 위로 했다. 다시 한번 허.리.띠를 졸라매자... 그래 다시 한번 허. 리. 띠.를 졸라매자. 그 글은 비교적 경쾌하게 읽혀 내려갔다. 아마 방송에 적합하도록 작가들의 손을 거쳐 서민적이지만 구질 구질 하지 않게 다시 다듬어졌을 것이다. 그리고 자칫 늘어지기 쉬운 오후 시간을 위해 남녀 디제이의 입담을 섞어 부러 더욱 깔깔거리고 있었을 것이다. 아니...사실은 정말로 그들은 행복해 보였다. 비록 10년 동안 그 흔한 여름휴가 한번 못가 봤지만, 그렇게 허리띠를 졸라맨 덕분에 지금까지 그들은 잘 살아 남았고... IMF라는 태풍속에서도 꿋꿋하게 살아남았지 않았던가. 그리고 더 허리띠를 졸라매서라도 살아남겠다고 다짐하고 있지 않았던가. 나는... 그만... 허리띠를 졸라매겠다고 두번이나 반복해 적어 놓은 부분에서... 두번이나 강조한 그것이 어떤것을 의미하는지 잘 이해하지 못하고 눈치없이 읽어 내려가는 디제이의 철없는 두번째 반복 부분에서 나도 모르게 울컥,...목울음이 넘어 오는것을 간신히 참아냈다. 티브 뉴스를 통해 "국민 여러분 우리 모두 어려운때 입니다. 다시 한번 허리띠를 졸라매서 지금의 어려운 시기를 슬기롭게 극복합시다'라고 동남아 골프여행권 두둑하게 챙겨 가지고 있을 어느 정치인의 엿같은 목소리와 점점 더 가늘어 가는 그녀의 허리가 겹쳐져 부아 치민 가슴을 애써 쓸어내리고 있었다.